2019 Honda Odyssey LX 9-Speed Automatic Transmission, 8-Way Power Adjustable Driver's Seat, Power Front Passenger Seat, Bluetooth*, Smart Entry w/ Push Button Start, Advanced Compatibility Engineering (ACE) Body Structure, Vehicle Stability Assist (VSA) with Traction Control, Brake Assist, One-motion 60/40 split 3rd-row Magic Seat, 3rd row seats: split-bench, Alloy wheels, Automatic temperature control, Cloth Seat Trim, Front dual zone A/C, Power door mirrors, Radio: 160-Watt AM/FM Audio System w/7 Speakers, Security system, Speed control, Steering wheel mounted audio controls. 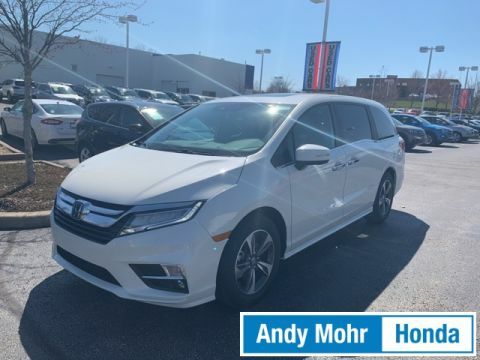 19/28 City/Highway MPG Get MOHR for your money at the ALL NEW Andy Mohr Honda in Bloomington! Call us today at 812-336-6865. 2019 Honda Odyssey EX 9-Speed Automatic Transmission, 12-Way Power Adjustable Driver's Seat, Power Front Passenger Seat, Heated Cloth Front Seats, Bluetooth*, Sirius / XM Radio*, Apple CarPlay / Android Auto Integration, Tri-Zone Automatic Climate Control with Humidity Control and Air Filtration, Smart Entry w/ Push Button Start, Remote Engine Start, Advanced Compatibility Engineering (ACE) Body Structure, Vehicle Stability Assist (VSA) with Traction Control, Brake Assist, Multi-Angle Rearview Camera with Guidelines, Honda Sensing, Forward Collision Warning (FCW), Collision Mitigation Braking System (CMBS), Road Departure Mitigation System (RDM), Lane Departure Warning (LDW), Lane Keeping Assist System (LKAS), Adaptive Cruise Control (ACC) with Low-Speed Follow, Blind Spot Information System, Cross Traffic Monitor, Automatic High Beams, Multi-function 2nd-row center seat, Magic Slide 2nd-row seats with armrests and walk-in feature, CabinControl remote compatibility, 7 Speakers, Automatic temperature control, Radio: 160-Watt AM/FM/HD/SiriusXM Audio System, Wheels: 18" Dark Silver-Painted Alloy. 19/28 City/Highway MPG Get MOHR for your money at the ALL NEW Andy Mohr Honda in Bloomington! Call us today at 812-336-6865. 2019 Honda Odyssey EX-L 9-Speed Automatic Transmission, 12-Way Power Adjustable Driver's Seat, Power Front Passenger Seat, Heated Leather Seats*, Memory Settings for Driver's Seat and Side Mirrors, Auto-Dimming Rearview Mirror, HondaLink Subscription Services, HomeLink Remote Garage Door System, CabinTalk In-Car PA System, Bluetooth*, Sirius / XM Radio*, Apple CarPlay / Android Auto Integration, Moonroof / Sunroof*, Tri-Zone Automatic Climate Control with Humidity Control and Air Filtration, Smart Entry System with Walk Away Auto Lock, Remote Engine Start, Advanced Compatibility Engineering (ACE) Body Structure, Vehicle Stability Assist (VSA) with Traction Control, Brake Assist, Multi-Angle Rearview Camera with Guidelines, Honda Sensing, Forward Collision Warning (FCW), Collision Mitigation Braking System (CMBS), Road Departure Mitigation System (RDM), Lane Departure Warning (LDW), Lane Keeping Assist System (LKAS), Adaptive Cruise Control (ACC) with Low-Speed Follow, Blind Spot Information System, Cross Traffic Monitor, Automatic High Beams, Power Tailgate, Multi-function 2nd-row center seat, Magic Slide 2nd-row seats with armrests and walk-in feature, 7 Speakers, Radio: 160-Watt AM/FM/HD/SiriusXM Audio System, Wheels: 18" Dark Silver-Painted Alloy. 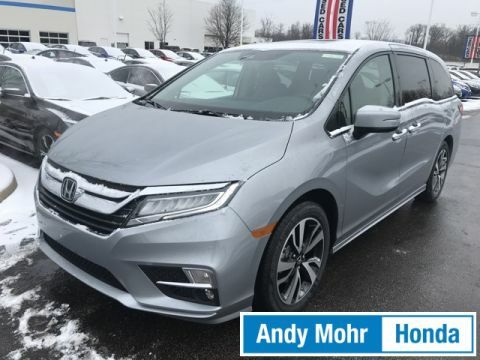 19/28 City/Highway MPG Get MOHR for your money at the ALL NEW Andy Mohr Honda in Bloomington! Call us today at 812-336-6865. 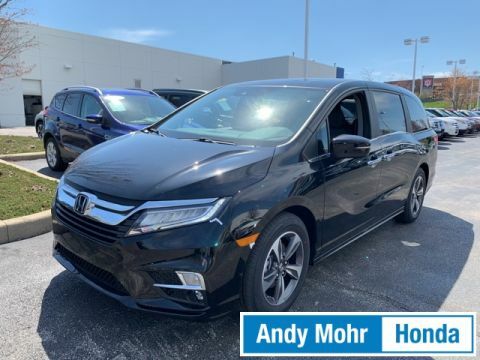 2019 Honda Odyssey EX-L 19/28 City/Highway MPG Get MOHR for your money at the ALL NEW Andy Mohr Honda in Bloomington! Call us today at 812-336-6865. 2019 Honda Odyssey EX-L 9-Speed Automatic Transmission, 12-Way Power Adjustable Driver's Seat, Power Front Passenger Seat, Heated Leather Seats*, Memory Settings for Driver's Seat and Side Mirrors, Auto-Dimming Rearview Mirror, HondaLink Subscription Services, HomeLink Remote Garage Door System, CabinTalk In-Car PA System, Bluetooth*, Sirius / XM Radio*, Apple CarPlay / Android Auto Integration, Moonroof / Sunroof*, Tri-Zone Automatic Climate Control with Humidity Control and Air Filtration, Smart Entry w/ Push Button Start, Remote Engine Start, Advanced Compatibility Engineering (ACE) Body Structure, Vehicle Stability Assist (VSA) with Traction Control, Brake Assist, Multi-Angle Rearview Camera with Guidelines, Honda Sensing, Forward Collision Warning (FCW), Collision Mitigation Braking System (CMBS), Road Departure Mitigation System (RDM), Lane Departure Warning (LDW), Lane Keeping Assist System (LKAS), Adaptive Cruise Control (ACC) with Low-Speed Follow, Blind Spot Information System, Cross Traffic Monitor, Automatic High Beams, Fog Lights, Power Side Mirrors with Integrated LED Turn Indicators, Power Tailgate, Alloy Wheels, CabinControl remote compatibility, Magic Slide 2nd-row seats with armrests and walk-in feature, Multi-function 2nd-row center seat, 3rd row seats: split-bench, 7 Speakers, Automatic temperature control, Radio: 160-Watt AM/FM/HD/SiriusXM Audio System, Wheels: 18" Dark Silver-Painted Alloy. 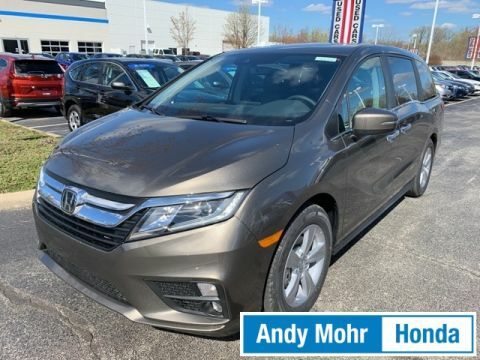 19/28 City/Highway MPG Get MOHR for your money at the ALL NEW Andy Mohr Honda in Bloomington! Call us today at 812-336-6865. 2019 Honda Odyssey EX-L 9-Speed Automatic Transmission, 12-Way Power Adjustable Driver's Seat, Power Front Passenger Seat, Heated Leather Seats*, Memory Settings for Driver's Seat and Side Mirrors, Auto-Dimming Rearview Mirror, HondaLink Subscription Services, HomeLink Remote Garage Door System, Bluetooth*, Sirius / XM Radio*, Apple CarPlay / Android Auto Integration, Moonroof / Sunroof*, Tri-Zone Automatic Climate Control with Humidity Control and Air Filtration, Smart Entry w/ Push Button Start, Remote Engine Start, Advanced Compatibility Engineering (ACE) Body Structure, Vehicle Stability Assist (VSA) with Traction Control, Brake Assist, Multi-Angle Rearview Camera with Guidelines, Honda Sensing, Forward Collision Warning (FCW), Collision Mitigation Braking System (CMBS), Road Departure Mitigation System (RDM), Lane Departure Warning (LDW), Lane Keeping Assist System (LKAS), Adaptive Cruise Control (ACC) with Low-Speed Follow, Blind Spot Information System, Cross Traffic Monitor, Automatic High Beams, Power Tailgate, Alloy Wheels, Multi-function 2nd-row center seat, Magic Slide 2nd-row seats with armrests and walk-in feature, Acoustic-glass windshield, Memory-linked side mirrors with reverse-gear tilt-down, 7 Speakers, A/V remote: CabinControl, Automatic temperature control, Radio: 160-Watt AM/FM/HD/SiriusXM Audio System. 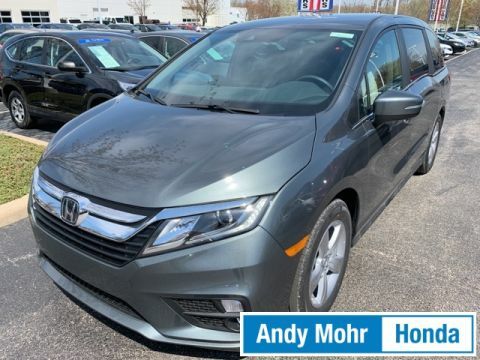 19/28 City/Highway MPG Get MOHR for your money at the ALL NEW Andy Mohr Honda in Bloomington! Call us today at 812-336-6865. 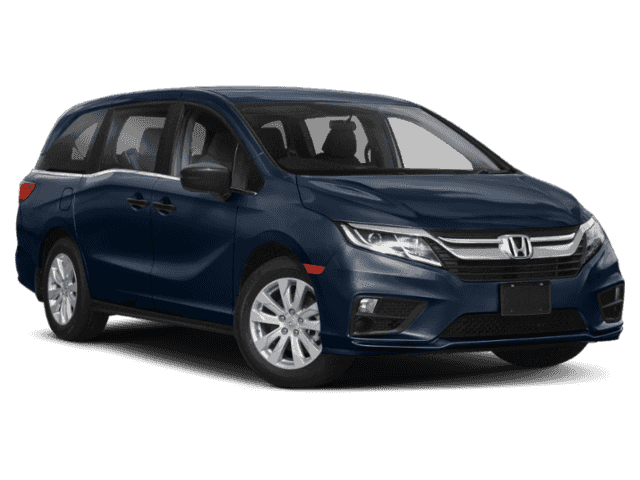 2019 Honda Odyssey EX-L 9-Speed Automatic Transmission, 12-Way Power Adjustable Driver's Seat, Power Front Passenger Seat, Heated Leather Seats*, Memory Settings for Driver's Seat and Side Mirrors, Auto-Dimming Rearview Mirror, HondaLink Subscription Services, HomeLink Remote Garage Door System, CabinTalk In-Car PA System, Bluetooth*, Sirius / XM Radio*, Apple CarPlay / Android Auto Integration, Honda Satellite-Linked Navigation System With Voice Recognition and Honda HD Digital Traffic, Rear Seat Entertainment / DVD*, Moonroof / Sunroof*, Tri-Zone Automatic Climate Control with Humidity Control and Air Filtration, Smart Entry w/ Push Button Start, Remote Engine Start, Advanced Compatibility Engineering (ACE) Body Structure, Vehicle Stability Assist (VSA) with Traction Control, Brake Assist, Multi-Angle Rearview Camera with Guidelines, Honda Sensing, Forward Collision Warning (FCW), Collision Mitigation Braking System (CMBS), Road Departure Mitigation System (RDM), Lane Departure Warning (LDW), Lane Keeping Assist System (LKAS), Adaptive Cruise Control (ACC) with Low-Speed Follow, Blind Spot Information System, Cross Traffic Monitor, Automatic High Beams, Power Tailgate, Magic Slide 2nd-row seats with armrests and walk-in feature, Multi-function 2nd-row center seat, Acoustic-glass windshield. 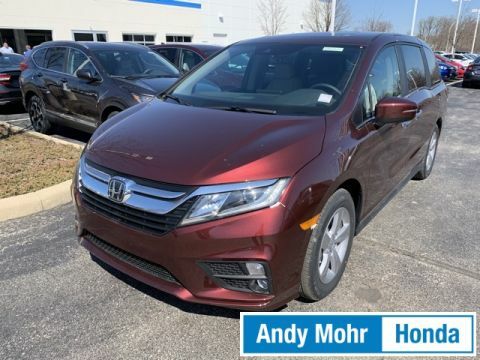 19/28 City/Highway MPG Get MOHR for your money at the ALL NEW Andy Mohr Honda in Bloomington! Call us today at 812-336-6865. 2019 Honda Odyssey EX-L 9-Speed Automatic Transmission, 12-Way Power Adjustable Driver's Seat, Power Front Passenger Seat, Heated Leather Seats*, Memory Settings for Driver's Seat and Side Mirrors, Auto-Dimming Rearview Mirror, HondaLink Subscription Services, HomeLink Remote Garage Door System, CabinTalk In-Car PA System, Bluetooth*, Sirius / XM Radio*, Apple CarPlay / Android Auto Integration, Honda Satellite-Linked Navigation System With Voice Recognition and Honda HD Digital Traffic, Rear Seat Entertainment / DVD*, Moonroof / Sunroof*, Tri-Zone Automatic Climate Control with Humidity Control and Air Filtration, Smart Entry w/ Push Button Start, Remote Engine Start, Advanced Compatibility Engineering (ACE) Body Structure, Vehicle Stability Assist (VSA) with Traction Control, Brake Assist, Multi-Angle Rearview Camera with Guidelines, Honda Sensing, Forward Collision Warning (FCW), Collision Mitigation Braking System (CMBS), Road Departure Mitigation System (RDM), Lane Departure Warning (LDW), Lane Keeping Assist System (LKAS), Adaptive Cruise Control (ACC) with Low-Speed Follow, Blind Spot Information System, Cross Traffic Monitor, Automatic High Beams, Power Side Mirrors with Integrated LED Turn Indicators, Power Tailgate, Alloy Wheels, Multi-function 2nd-row center seat, Magic Slide 2nd-row seats with armrests and walk-in feature, Acoustic-glass windshield, 7 Speakers, Automatic temperature control, Radio: 160-Watt AM/FM/HD/SiriusXM Audio System, Wheels: 18" Dark Silver-Painted Alloy. 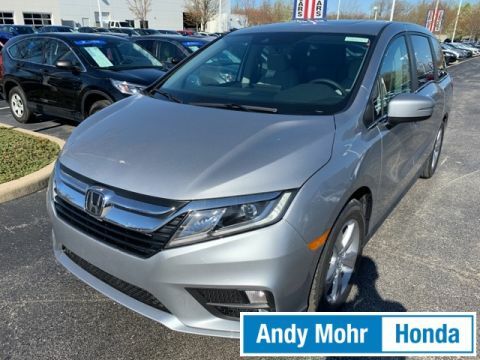 19/28 City/Highway MPG Get MOHR for your money at the ALL NEW Andy Mohr Honda in Bloomington! Call us today at 812-336-6865. 2019 Honda Odyssey Touring 12-Way Power Adjustable Driver's Seat, Power Front Passenger Seat, Heated Leather Seats*, Memory Settings for Driver's Seat and Side Mirrors, Auto-Dimming Rearview Mirror, HondaLink Subscription Services, HomeLink Remote Garage Door System, CabinTalk In-Car PA System, Sirius / XM Radio*, Honda Satellite-Linked Navigation System With Voice Recognition and Honda HD Digital Traffic, Rear Seat Entertainment / DVD*, Mobile Hotspot Capability, Moonroof / Sunroof*, Tri-Zone Automatic Climate Control with Humidity Control and Air Filtration, Smart Entry System with Walk Away Auto Lock, Remote Engine Start, Advanced Compatibility Engineering (ACE) Body Structure, Vehicle Stability Assist (VSA) with Traction Control, Brake Assist, Multi-Angle Rearview Camera with Guidelines, Honda Sensing, Forward Collision Warning (FCW), Collision Mitigation Braking System (CMBS), Road Departure Mitigation System (RDM), Lane Departure Warning (LDW), Lane Keeping Assist System (LKAS), Adaptive Cruise Control (ACC) with Low-Speed Follow, Blind Spot Information System, Cross Traffic Monitor, Parking Sensors, Automatic High Beams, Fully Automatic LED Headlights, LED Fog Lights, Hands-Free Access Power Tailgate, 10-speed automatic transmission with idle-stop and paddle shifters, HondaVAC, Acoustic-glass windshield, front- and sliding-door windows, Multi-zone audio, 7 Speakers, Alloy wheels, Radio: 160-Watt AM/FM/HD/SiriusXM Audio System. 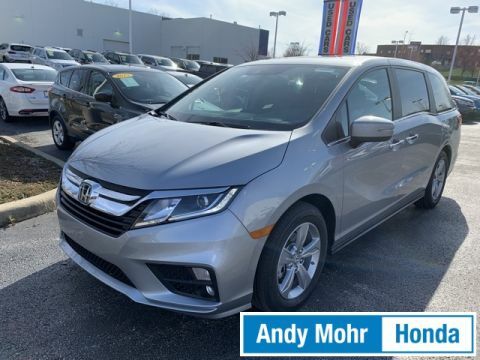 19/28 City/Highway MPG Get MOHR for your money at the ALL NEW Andy Mohr Honda in Bloomington! Call us today at 812-336-6865. 2019 Honda Odyssey Touring 12-Way Power Adjustable Driver's Seat, Power Front Passenger Seat, Heated Leather Seats*, Memory Settings for Driver's Seat and Side Mirrors, Auto-Dimming Rearview Mirror, HondaLink Subscription Services, HomeLink Remote Garage Door System, CabinTalk In-Car PA System, Bluetooth*, Sirius / XM Radio*, Apple CarPlay / Android Auto Integration, Honda Satellite-Linked Navigation System With Voice Recognition and Honda HD Digital Traffic, Mobile Hotspot Capability, Moonroof / Sunroof*, Tri-Zone Automatic Climate Control with Humidity Control and Air Filtration, Smart Entry System with Walk Away Auto Lock, Remote Engine Start, Advanced Compatibility Engineering (ACE) Body Structure, Vehicle Stability Assist (VSA) with Traction Control, Brake Assist, Multi-Angle Rearview Camera with Guidelines, Honda Sensing, Forward Collision Warning (FCW), Collision Mitigation Braking System (CMBS), Road Departure Mitigation System (RDM), Lane Departure Warning (LDW), Lane Keeping Assist System (LKAS), Adaptive Cruise Control (ACC) with Low-Speed Follow, Blind Spot Information System, Cross Traffic Monitor, Parking Sensors, Automatic High Beams, Fully Automatic LED Headlights, Hands-Free Access Power Tailgate, 10-speed automatic transmission with idle-stop and paddle shifters, LED headlights with auto-on/off and WiperLink, Acoustic-glass windshield, Magic Slide 2nd-row seats with armrests and walk-in feature, Multi-function 2nd-row seats with armrests and walk-in feature, HondaVAC, 7 Speakers, A/V remote: CabinControl, Alloy wheels, Automatic temperature control, Radio: 160-Watt AM/FM/HD/SiriusXM Audio System. 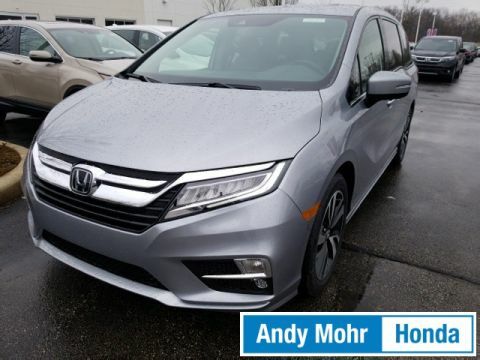 19/28 City/Highway MPG Get MOHR for your money at the ALL NEW Andy Mohr Honda in Bloomington! Call us today at 812-336-6865. 2019 Honda Odyssey Elite Heated Leather Seats*, Bluetooth*, GPS / Navigation*, Rear Seat Entertainment / DVD*, Moonroof / Sunroof*, 11 Speakers, 3rd row seats: split-bench, 4-Wheel Disc Brakes, A/V remote: CabinControl, Air Conditioning, Anti-whiplash front head restraints, Auto High-beam Headlights, Auto-dimming Rear-View mirror, Automatic temperature control, Blind spot sensor: Blind Spot Information (BSI) System warning, Brake assist, CD player, Compass, Distance-Pacing Cruise Control, DVD-Audio, Electronic Stability Control, Emergency communication system, Entertainment system, Exterior Parking Camera Rear, Four wheel independent suspension, Front anti-roll bar, Front dual zone A/C, Front fog lights, Fully automatic headlights, Garage door transmitter: HomeLink, Headphones, Heated & Ventilated Front Bucket Seats, Heated door mirrors, Heated steering wheel, Illuminated entry, Leather Seat Trim, Leather steering wheel, Low tire pressure warning, Memory seat, Navigation system: Honda Satellite-Linked Navigation System, Occupant sensing airbag, Outside temperature display, Overhead airbag, Power door mirrors, Power Liftgate, Power moonroof, Power passenger seat, Radio: 550-Watt AM/FM/HD Premium Audio System, Rain sensing wipers, Rear air conditioning, Rear anti-roll bar, Rear audio controls, Reclining 3rd row seat, Remote keyless entry, Security system, Speed control, Speed-sensing steering, Split folding rear seat, Steering wheel mounted audio controls, Sun blinds, Telescoping steering wheel, Tilt steering wheel, Traction control, Turn signal indicator mirrors, Ventilated front seats, Wheels: 19" Machine-Finished Alloy. 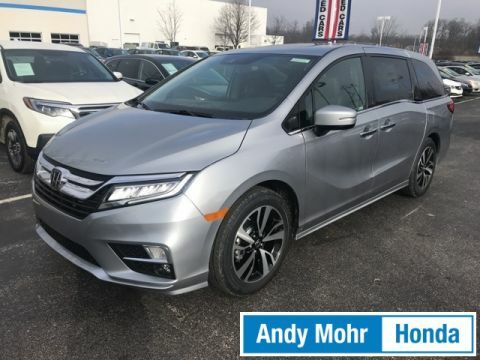 19/28 City/Highway MPG Get MOHR for your money at the ALL NEW Andy Mohr Honda in Bloomington! Call us today at 812-336-6865. 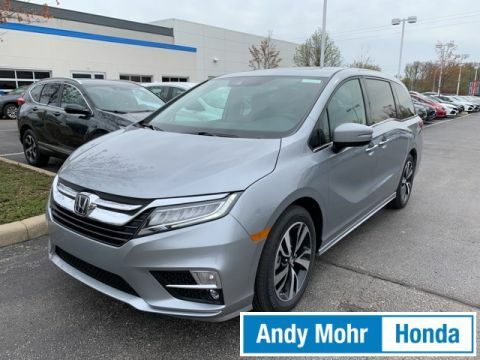 2019 Honda Odyssey Elite 19/28 City/Highway MPG Get MOHR for your money at the ALL NEW Andy Mohr Honda in Bloomington! Call us today at 812-336-6865. 2019 Honda Odyssey Elite 12-Way Power Adjustable Driver's Seat, Power Front Passenger Seat, Heated Leather Seats*, Ventilated Front Seats, Heated Rear Seats, Memory Settings for Driver's Seat and Side Mirrors, Auto-Dimming Rearview Mirror, HondaLink Subscription Services, HomeLink Remote Garage Door System, CabinTalk In-Car PA System, Bluetooth*, Sirius / XM Radio*, Apple CarPlay / Android Auto Integration, Honda Satellite-Linked Navigation System With Voice Recognition and Honda HD Digital Traffic, Wireless Phone Charger, Mobile Hotspot Capability, Rain-Sensing Windshield Wipers, Moonroof / Sunroof*, Tri-Zone Automatic Climate Control with Humidity Control and Air Filtration, Smart Entry System with Walk Away Auto Lock, Remote Engine Start, Advanced Compatibility Engineering (ACE) Body Structure, Vehicle Stability Assist (VSA) with Traction Control, Brake Assist, Multi-Angle Rearview Camera with Guidelines, Honda Sensing, Forward Collision Warning (FCW), Collision Mitigation Braking System (CMBS), Road Departure Mitigation System (RDM), Lane Departure Warning (LDW), Lane Keeping Assist System (LKAS), Adaptive Cruise Control (ACC) with Low-Speed Follow, Blind Spot Information System, Cross Traffic Monitor, Parking Sensors, Automatic High Beams, Fully Automatic LED Headlights, LED Fog Lights, Power-Folding Side Mirrors, Hands-Free Access Power Tailgate, 10-speed automatic transmission with idle-stop and paddle shifters, Multi-zone audio, Blue ambient LED lighting, Acoustic-glass windshield, front- and sliding-door windows, HondaVAC, 11 Speakers, Alloy wheels, Radio: 550-Watt AM/FM/HD Premium Audio System. 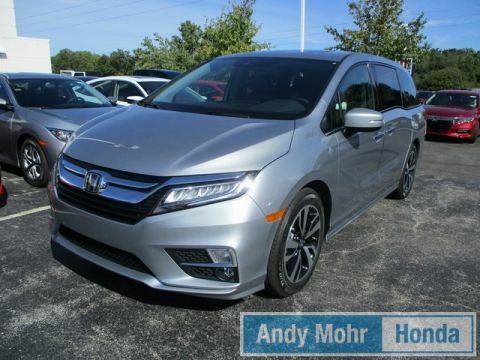 19/28 City/Highway MPG Get MOHR for your money at the ALL NEW Andy Mohr Honda in Bloomington! Call us today at 812-336-6865. 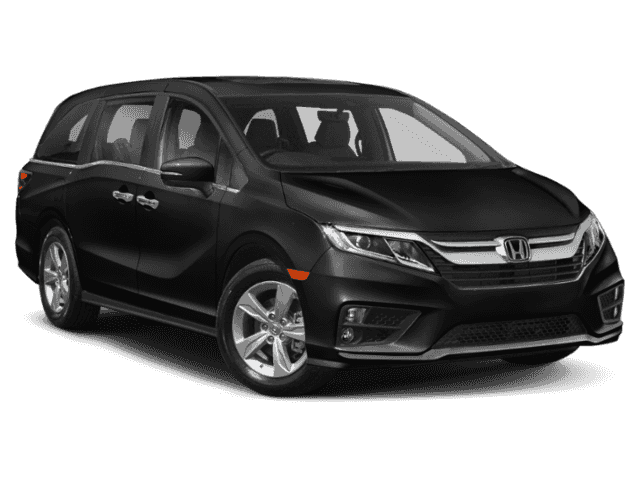 2019 Honda Odyssey Elite 12-Way Power Adjustable Driver's Seat, Power Front Passenger Seat, Heated Leather Seats*, Ventilated Front Seats, Memory Settings for Driver's Seat and Side Mirrors, Heated Steering Wheel, Auto-Dimming Rearview Mirror, HondaLink Subscription Services, HomeLink Remote Garage Door System, CabinTalk In-Car PA System, Bluetooth*, Sirius / XM Radio*, Apple CarPlay / Android Auto Integration, Honda Satellite-Linked Navigation System With Voice Recognition and Honda HD Digital Traffic, Rear Seat Entertainment / DVD*, Wireless Phone Charger, Mobile Hotspot Capability, Rain-Sensing Windshield Wipers, Panoramic Roof, Tri-Zone Automatic Climate Control with Humidity Control and Air Filtration, Smart Entry System with Walk Away Auto Lock, Remote Engine Start, Advanced Compatibility Engineering (ACE) Body Structure, Vehicle Stability Assist (VSA) with Traction Control, Brake Assist, Multi-Angle Rearview Camera with Guidelines, Honda Sensing, Forward Collision Warning (FCW), Collision Mitigation Braking System (CMBS), Road Departure Mitigation System (RDM), Lane Departure Warning (LDW), Lane Keeping Assist System (LKAS), Adaptive Cruise Control (ACC) with Low-Speed Follow, Blind Spot Information System, Cross Traffic Monitor, Parking Sensors, Automatic High Beams, Fully Automatic LED Headlights, LED Daytime Running Lights (DRL), Power Side Mirrors with Integrated LED Turn Indicators, Power-Folding Side Mirrors, Power Tailgate, Hands-Free Access Power Tailgate, 10-Speed Automatic Transmission, 11 Speakers, 3rd row seats: split-bench, Alloy wheels, Reclining 3rd row seat, Split folding rear seat, Sun blinds. 19/28 City/Highway MPG Get MOHR for your money at the ALL NEW Andy Mohr Honda in Bloomington! Call us today at 812-336-6865. 2019 Honda Odyssey Elite 12-Way Power Adjustable Driver's Seat, Power Front Passenger Seat, Heated Leather Seats*, Ventilated Front Seats, Heated Steering Wheel, Auto-Dimming Rearview Mirror, HondaLink Subscription Services, HomeLink Remote Garage Door System, CabinTalk In-Car PA System, Bluetooth*, Sirius / XM Radio*, Apple CarPlay / Android Auto Integration, Honda Satellite-Linked Navigation System With Voice Recognition and Honda HD Digital Traffic, Rear Seat Entertainment / DVD*, Wireless Phone Charger, Mobile Hotspot Capability, Rain-Sensing Windshield Wipers, Moonroof / Sunroof*, Tri-Zone Automatic Climate Control with Humidity Control and Air Filtration, Smart Entry System with Walk Away Auto Lock, Remote Engine Start, Advanced Compatibility Engineering (ACE) Body Structure, Vehicle Stability Assist (VSA) with Traction Control, Brake Assist, Multi-Angle Rearview Camera with Guidelines, Honda Sensing, Forward Collision Warning (FCW), Collision Mitigation Braking System (CMBS), Road Departure Mitigation System (RDM), Lane Departure Warning (LDW), Lane Keeping Assist System (LKAS), Adaptive Cruise Control (ACC) with Low-Speed Follow, Blind Spot Information System, Cross Traffic Monitor, Parking Sensors, Automatic High Beams, Fully Automatic LED Headlights, Hands-Free Access Power Tailgate, Blue ambient LED lighting, Acoustic-glass windshield, front- and sliding-door windows, HondaVAC, Magic Slide 2nd-row seats with armrests and walk-in feature, Multi-function 2nd-row center seat, 11 Speakers, Radio: 550-Watt AM/FM/HD Premium Audio System, Wheels: 19" Machine-Finished Alloy. 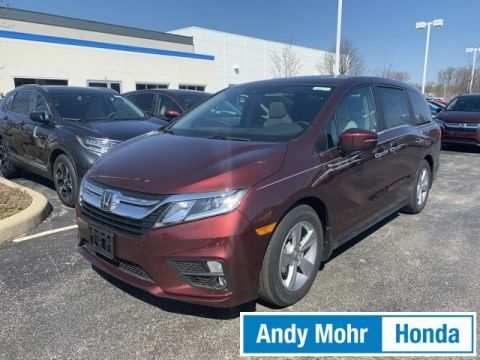 19/28 City/Highway MPG Get MOHR for your money at the ALL NEW Andy Mohr Honda in Bloomington! Call us today at 812-336-6865.